Ok, every week or two I post some behind the scenes snippets of what I’m up to in my practice as The SHIFT-IT Coach (Facilitator, Coach and Trainer). Its interesting work in its variety and scope and I’m blessed to work with the fascinating and fabulous people that I do (thank you for finding me!). Most of client work is confidential, so I can’t share specifics or the Visual Maps that I’m creating as I work in-person or virtually with my clients (via webinar and digital drawing tablet). However these blurbs give folks who are considering working with me (again as a Repeat Client or fresh as a New Client) an idea of the range of things that I help with. Fundamentals of Working Visually (Fall’s Online Course, Session 12 of 18) Visual Coaching Module. Overview on the “4th Animal”, the main applications of Working Visually. Review of Visual Coaching Portfolio. Demo Using ‘Wouldn’t It Be Nice If’ Template with volunteer. Assignments To Go Find Client (not a family member or close friend!) to use map with to get a taste for this application. Instruction and map provided. Private Coaching Client: Via Webinar: Canadian Communications Specialist. Weaving visual skills into her suite of offerings. Has determined Business Name for her new independent practice. Working on Identity Package, Website and Offerings. Bit down on herself but she’s actually making fast progress especially given a concurrent grief process is happening due to traumatic death of loved one. Full Day Video Shoot with Local Videographer: Updating training videos for my Fundamentals of Working Visually course: Graphic Aerobics, Lettering, Zen of Icons, Handy Tips and Graphic Recording Demo. Exploratory Chat : from Netherlands. Looking for outreach support during phase out from her corporate job. 2nd time in 2 years. Discussed SHIFT-IT System either through Home Study Kit (for fastest access, do Deluxe if possible for private time with me) and attending January’s online course as Free Repeater in order to be with live cohort. Design Session with New Course Collaborator: Fast & Loose Drawing expert Rhoda Draws. Collaborating together on 10 Session online course for spring. Course outcomes, agenda, dates and times. Compiling photos and copy for sales page. Magic Marker Online Mastermind (Fall Online Course, Session 9 of 15) Review on Common Formats. Graphic Recording Drills Off Of Shared Content (Where Tech is Headed for Process Professionals and Humanity) Each member recorded in their studios (Canada, U.S., New Zealand, Bulgaria). Then Uploaded Pics to NING for feedback and discussion. Private Coaching Client: Via Webinar: German Visual Practitioner. Long term client. End of year summary – hit her financial goals! Visioning for 2019 – wants to double income again. Wouldn’t It Be Nice If exercise. As well as FLIP IT for teasing out and soothing doubts and other resistance. Back in 2 weeks for Action Plan with emphasis on marketing campaign. Private Coaching Client: Via Webinar: American Graphic Facilitator. Long term client. Transitioned from academic career into independent practice. End of year summary – increased her income by 5X! Working way through Biz Essentials Kit, had series of questions related to rates, offerings and building her bookkeeping, virtual assistant and marketing team. Private Coaching Session: Canadian Graphic Recorder & Coach. Branding and marketing discussion plus inner work around large upcoming family event. Double Private Coaching Session: Continued Work with 12-Pack Client on Body Image, Sexuality, Boundaries (keeping self safe) as she progresses through burlesque training. 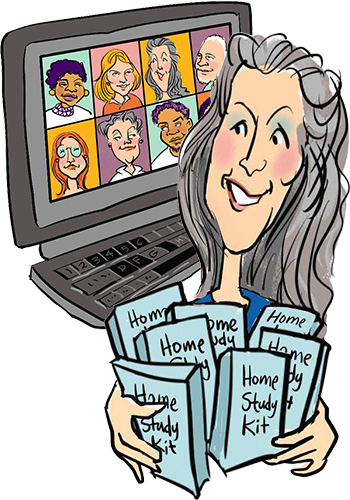 Private Coaching Session: Continued work with Science/IT client working way through SHIFT-IT Home Study Kit (after participation in Practical Energy Work courses). Right brain openings. Higher Self and another Being are communicating with her in meditations (channeling). MindScape Work to see what her subconscious has to say and guide about this (3 doorways). Also referral to Kendra Jonas for additional channeling support. Co Facilitation of One Day Event for Not for Profit, Sustainable Farm/ School COOP. Part of Global Ecovillage Network. Visual Strategic Planning in morning (history, present day analysis and vision) followed by Systemic Constellation Circle in afternoon (to determine 5 Bold Steps). Fascinating day … both I and my colleague are delighted with the innovative blend we are doing together! Magic Marker Online Mastermind: (Fall Online Course, Session 10 of 15) Check Ins. Dialogue and Inner Work. Emotional and vibrational management. Softening the shoulds. Embracing one’s individual unfoldment and trusting it, its order and its timing. Facilitating the finding of soothing thoughts (limbic sentences) to help one member in particular really gain perspective and soothe nervous system. 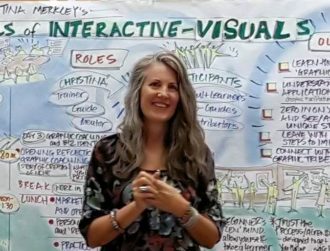 Fundamentals of Working Visually: (Fall Online Course, Session 13 of 18) Debrief of Visual Coaching assignment. Sharing of my journey with this niche within the niche. Development of my SHIFT-IT Visual Coaching System. Explanation of Visual Coach Certification and Its Application Process. Private Coaching Session: Channeler and Energy Worker. Discussion of recent advancements with one of beings she channels. Tips on how to do emergent energy work by distance rather than just in-person (using drawn surrogate and web conferencing). Private Coaching Client: Via Webinar American Graphic Designer / Learning Development Specialist. Working with last two years to add GR/GF to her offerings. Constellation session on rates last time. Sharing of positive progress since that session. Year end review plus visioning for 2019. Plus determination of rate increases for 2019 and beyond. 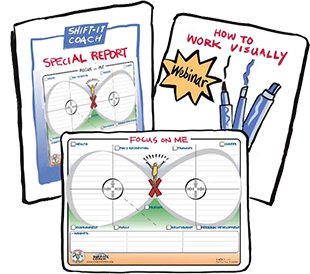 Double Private Coaching Session: Powerful FLIP IT session for American visual practitioner. Discomfort around visibility, increased public profile and greater levels of success. Family of Origin and Past Life roots. AlphaMind and Orphan Rescue (integration of Inner CEO with Inner Healer). Private Coaching Session: Long term client. American visual practitioner and Project Manager. Next level of work and life. Business development for Graphic Recording and Graphic Coaching offerings. Guidance on Digital Drawing Tablets and software. Improvements to Illustration / Drawing abilities. Private Coaching Client: Via Webinar College instructor juggling grad school, long distance relationship and dance extracurriculars. Continued work on sensuality/sexuality. Energy Work session: essence of Belly Dancing, Affirmation for Hips, Circ Nerve Supply on General Body / Blood System. Private Coaching Session: Established Graphic Recorder moving into Graphic Facilitation. Upleveling of clients, rates and offerings. Double session to provide support for upcoming knee surgery. Deep AlphaMind couples with energy work for pre and post op support. Exploratory chat: Long term client from my U.S.A. past in San Fran. IT executive. Gender transition. Post op. Ready for next round of visioning and action planning. Possible book. Going with 6 Pack of Online Distance Sessions. Systemic Constellation: Mentoring call with my teacher and cohort. Attendance at local constellation on weekend – lots of representative work. In preparation for running my own in-person constellations next year (already working online in my practice). SHIFT-IT eCommunity: Hosted December’s monthly drop-in eCommunity from grads of my coaching related programs. Did Appreciative Inquiry of 2018 using Positive Aspects Map. And visioning for 2019 using Wouldn’t It Be Nice If map. Design Session with Course Collaborator. Putting final touches with Bridget Nielsen on our SHIFT-IT for Starseeds Online Retreat for Dec. 29&30. Magic Marker Online Mastermind: (Fall Online Cohort, Session 11 of 15) Check ins. Celebration of a member’s website launch … yay! Resistance work with two other members. One about reactions to his goal of ‘Effective Independent Practice’ and book on his specialty niche. The other was around her procrastination around creating suitable space in her studio to work with the large size mural paper … all sorts of fears lying underneath that were brought into visibility and soothed. Fundamentals of Working Visually: (Fall Online Cohort, Session 15 of 18) Module on Business Development, Marketing and Money. Lots of juicy dialogue in bonus time, went for another hour. In order to work successfully as a Process Professional (whether internal or independent) you must as good at business as you are at your craft. Visual Coach Certification: (2018 Cohort Close) Last formal webinar for program. Now in final weeks of Submission and Exit Exam Process. Moving Flip It work on authenticity and coming from the heart. Go Visual Coaches go! Private Coaching Client: Session 5 of 12 pack. Big developments in her pursuit of figuring out her own modality and service expression. AlphaMind journey for discussion with Future Self about her emergent process and how to cope with being in the transitional Neutral Zone for now. Step by step.